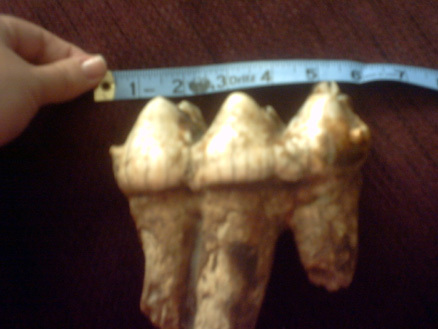 Has loxodont (Loxodonta means 'sloping teeth') molars. Each molar has a maximum of 10 ridges. has molars with parallel ridges. can have more than 20 ridges per molar. Mastodon molars were low-crowned and fairly small and had three or four prominent transverse ridges of enamel. Mastodons have fewer ridges on their molar teeth than elephants and the ridges are also less elevated. Stegodon was an ancestors of todays elephants, and developed larger molars, also with transverse enamel ridges. 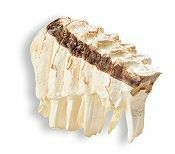 Mammuthus planifrons and Mammuthus meridionalis had 12 and 14 ridges on their molars, while the Wooly Mammoth (Mammuthus primigenius) had 27 such ridges, probably because of its extreme browsing diet. Elephants chew with a fore and aft motion of the jaw, grinding the food across the lophs. The molars of different species differ considerably, and is one of the most important key�s for paleontologists to determine the species of a fossil, since teeth are one of the most common findings in excavation sites.